If you’re proud of significant eco-friendly improvements to your home, Coral Gables Television (CGTV) wants to showcase your story. “Green Homes of Coral Gables” is a new show that demonstrates why Coral Gables is quickly on its way to becoming a greener City thanks to the dedication of local residents. In this first episode, long-time resident and environmentalist Sallye Jude talks about the total green upgrade to her French Normandy Village house built originally in 1926. 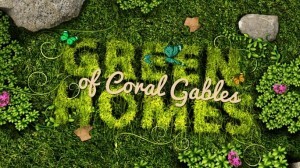 To have your home featured in the next Green Homes of Coral Gables episode, contact bmoles@coralgables.com. If you would like to see the first episode of Green Homes of Coral Gables click here.